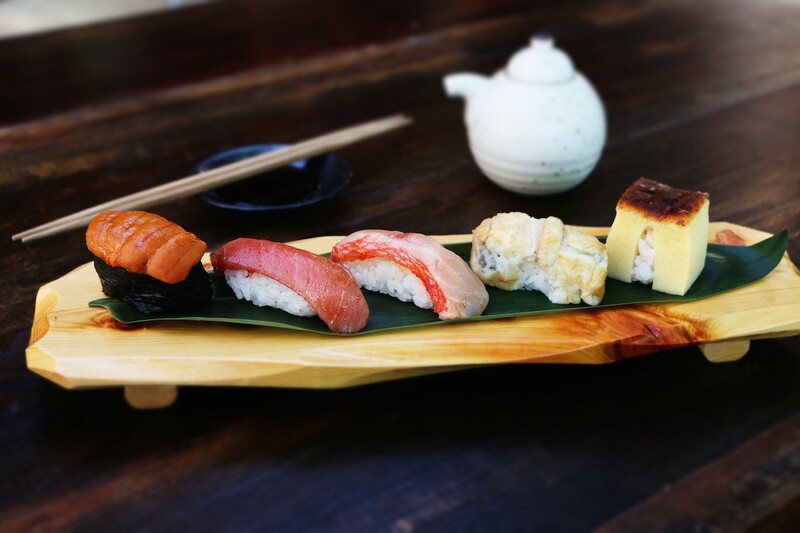 Kata Robata serves up artful Japanese cuisine and a show at its sushi bar. Photo by Paula Murphy. Step away from the sad desk lunch. Short of a pay raise, little lifts your spirits on a glum work day like going out for a fantastic midday meal. Sure, there are plenty of lunch options around Houston, but when considering the quality-to-value ratio, our affordable suggestions below blow away cheap takeout. While it’s possible to enjoy any of these meals alone, coworkers and nearby friends might want to make a great escape, too. Check out this list of specials and be the lunchtime hero who knows exactly where to go for a good deal and a great meal. 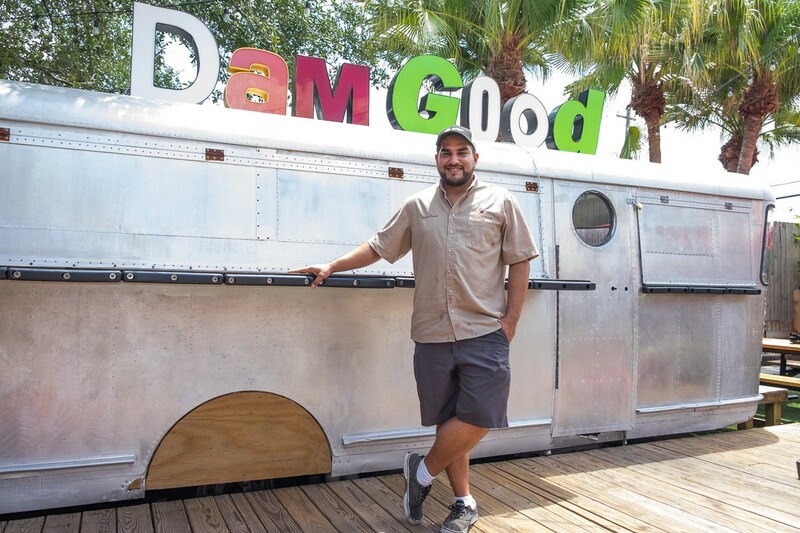 Chef and pitmaster Arash Karat at casual hangout Beaver’s on Westheimer. Photo by Phaedra Cook. Beaver’s, 6025 Westheimer: The spacious Beaver’s West location has a $13 daily lunch special. Served with soup de jour (which they simply call “daily soup” on the menu since they eschew anything that smacks of being fancy), there’s a different dish for every day of the week. Monday is a barbecue shrimp po’ boy with fries, Tuesday is “chicken fried chicken” with mashed potatoes and green beans, and so on. Worst case scenario: if you don’t want the special of the day, you can always just get a big ol’ tray of chef and pitmaster Arash Karat’s barbecue. 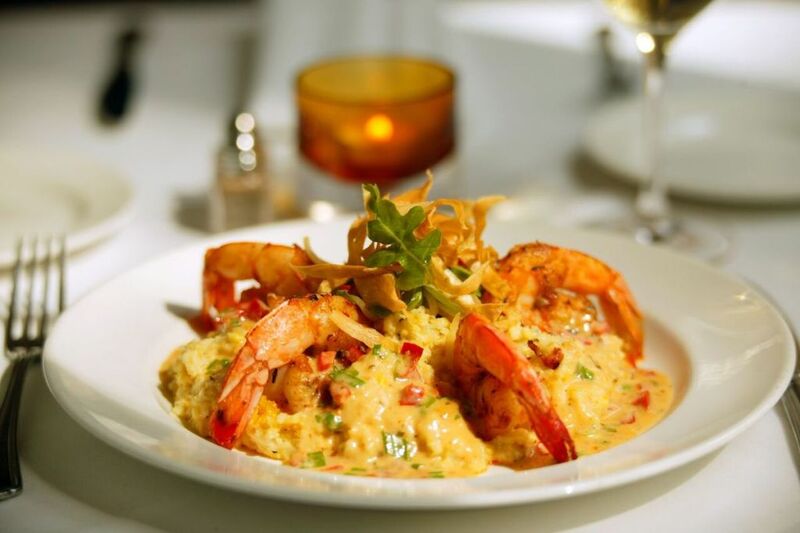 Enjoy Gulf Coast favorites like shrimp and grits for lunch at Brennan’s, in addition to a mini-martini for a quarter. Photo courtesy of Brennan’s of Houston. Brennan’s Of Houston, 3300 Smith: The classic New Orleans-style restaurant features lunch-sized portions of traditional favorites like turtle soup, jumbo lump crab cakes, shrimp and grits, and Gulf Fish Pontchartrain topped with jumbo lump crab, shrimp, crispy Louisiana oysters and Parmesan mushroom rice. The real steal, though, are the 25-cent mini-martinis available with purchase of an entrée. The limit is three per person, but these pack a punch, so don’t expect to do a lot of work if you hit the limit. Lunch hours at Brennan’s last from 11 a.m. to 2 p.m. Monday through Friday. 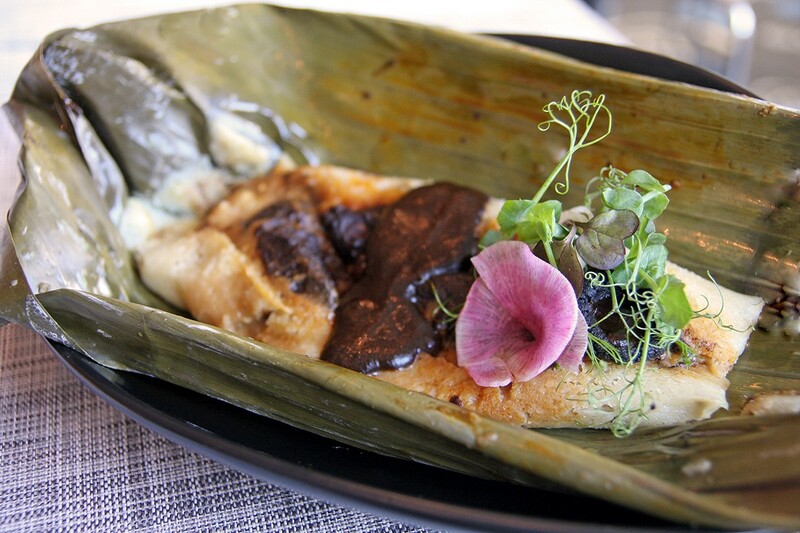 Caracol, 2200 Post Oak, Hugo’s, 1600 Westheimer and Xochi, 1700 Walker: Lunchtime diners located near the Galleria, Montrose or downtown can all have a two-course lunch created by James Beard Award-winning chef Hugo Ortega for $24. Guests choose their own two courses from over a dozen items. Using Caracol as an example, start with Tostadas de Atún Crudo, or tuna on black tostadas dressed with sour orange mayonnaise, leeks and soy-citrus dressing then wrap up (so to speak) with Taquitos Tronadores de Carnitas, or crispy rolled pork tacos topped with avocado-tomatillo salsa, crema fresca and queso fresco. Considering the combinations available among all three restaurants, diners could hit this deal once a week and not get bored for months. An example of the $8.95 “pick three” plate lunch at D’Amico’s in Rice Village featuring one of its oversized, filling meatballs. Photo by Paula Murphy. D’Amico’s Italian Market and Cafe, 5510 Morningside: For those who work or study near West University and have a hankering for homestyle Sicilian food and red sauce, D’Amico’s offers lots of options for weekday customers. In addition to lunch portions of menu favorites available from 11 a.m. to 4 p.m. on weekdays, the restaurant offers a menu of daily specials. It includes mix-and-match plates for $8.95 that allow diners to choose three items depending on the day of the week. Options range from a variety of proteins like meatballs, gnocchi or fish, to vegetable dishes, pasta salads and dessert. The special lunch menu is offered 11 a.m. to 2 p.m. Monday through Friday. El Tiempo, multiple locations: When it comes to bang for the buck, the Houston-grown Tex-Mex chain El Tiempo offers big lunch portions that might even allow for leftovers. That especially applies on to-go orders, which include chips and servings of red and green salsa. Though it’s tempting to order classics like enchiladas, tamales, or one of many combination plates from the extensive lunch menu, lighter options like Xochitl Chicken and Veggie & Avocado Soup for $7.49 offer flavorful, filling meals that won’t end in an afternoon nap at the desk. El Tiempo’s lunch menu is served from 11 a.m. to 3 p.m. daily, with the exception of holidays. Just one example of a Himalaya lunch combo. Selections change daily. Photo by Michael Shum. Himalaya, 6652 Southwest Freeway: While it’s a lot of fun to visit Himalaya in the evening and load down the table with spicy, sharable Indian and Pakistani entrées for a group dinner, lunch should not be overlooked. 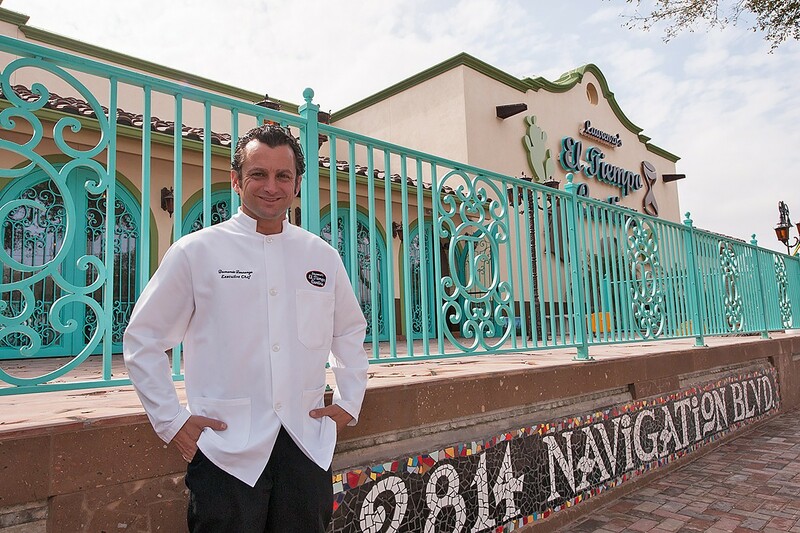 Chef and owner Kaiser Lashkari is always changing up his $13.75 daily lunch combo. 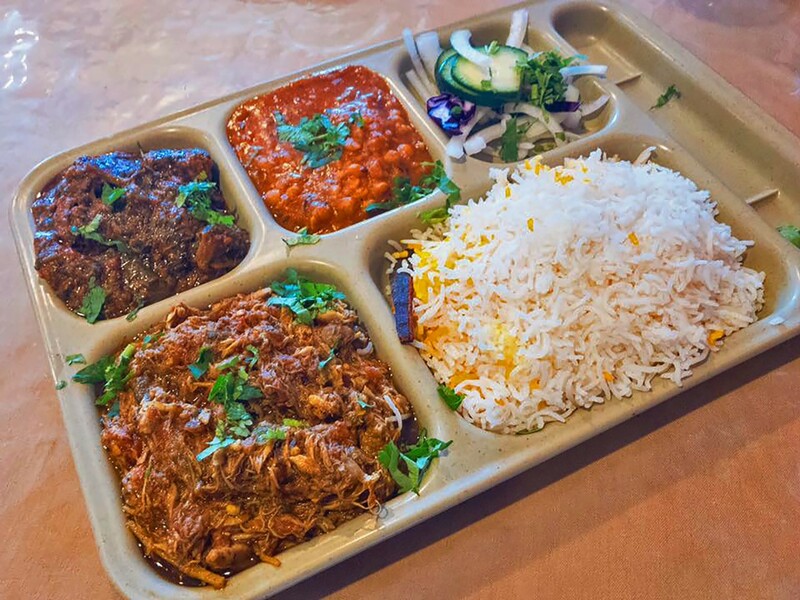 Served on an old-school compartmented lunch tray, entrée selections include lamb or chicken curry. Sides include an appetizer of the day, dal (lentil stew) or a vegetable, and the requisite basmati rice and naan comes alongside. Trust us: nothing else served on a school lunch tray ever tasted this good before. It’s served Tuesday through Friday from 11:30 a.m. to 2:30 p.m.
Gyu-Kaku Japanese BBQ, 510 Gray Street and 11301 Katy Freeway: Fair warning for Texas barbecue fans: the “BBQ” attached to Gyu-Kaku’s name refers to the cooking performed at each table’s charcoal grill. Still, meat lovers will find a lot to like about the plentiful (and filling) lunch options, available long before and after most restaurants offer lunch. It’s available from the time the restaurant opens at 10:30 a.m. until 6 p.m. Guests can mix and match options like rib eye, pork belly and shrimp, or opt for set menus. Salad, miso soup and rice are included in the affordable cost; even adding premium upgrades like swapping $3 Beef Sukiyaki Bibimbap for regular rice won’t set diners back more than about $20. Kata Robata, 3600 Kirby: When it comes to upscale sushi favorites, it’s easy to feel intimidated by the potential cost. High-quality fish doesn’t usually come cheap. Luckily for Houstonians, Kata Robata offers a lunch menu with most items falling under $20, and options range from traditional sushi to an excellent tonkotsu ramen. Five pieces of sushi and a California roll runs for $14 and various bento boxes served with a choice of salad or steamed rice range from $15 to $21. Even for lunch, reservation are recommended at this Upper Kirby hotspot. The lunch menu is available from 11:30 a.m. to 3 p.m. Mondays through Fridays. Chef Mark Schmidt at Rainbow Lodge comes up with a new topping combinations weekly for the wild game burgers served on Fridays. 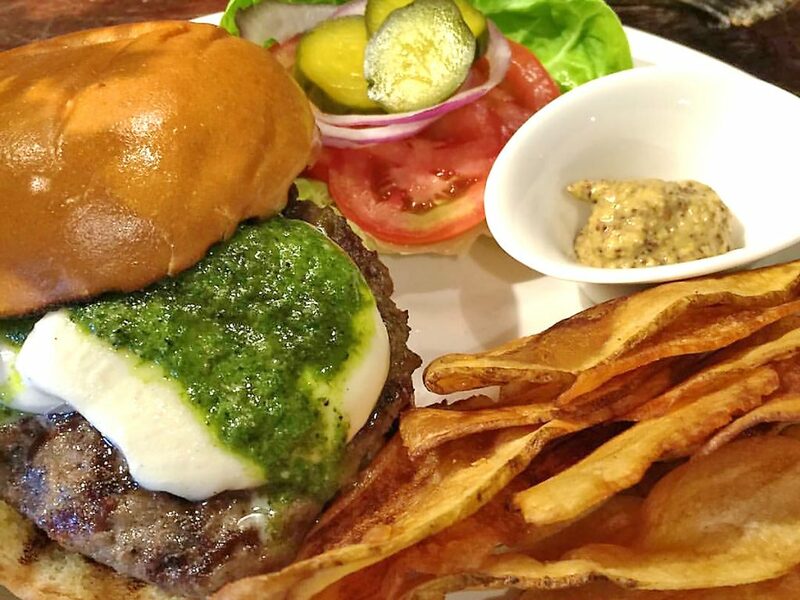 Pictured is a mozzarella-pesto burger with all the trimmings. Photo courtesy of Rainbow Lodge. Rainbow Lodge, 2011 Ella: No time to linger? Order the $15 three-course business lunch. Start with a cup of gumbo or salad, choose from a featured fish filet or pork tenderloin and wrap up with a petite sweet. Those who go out on Fridays might also check out the lunchtime-only Wild Game Burger. The patty is a blend of buffalo, elk and beef ribeye, but the toppings are whatever creative combination chef Mark Schmidt came up with that week. A recent version was topped with pimento cheese and came with all the usual trimmings, such as pickles, lettuce and tomato. Another week featured grilled mushrooms and gruyere. In other words: the $13 Friday-only game burger has a strong following for good reason. 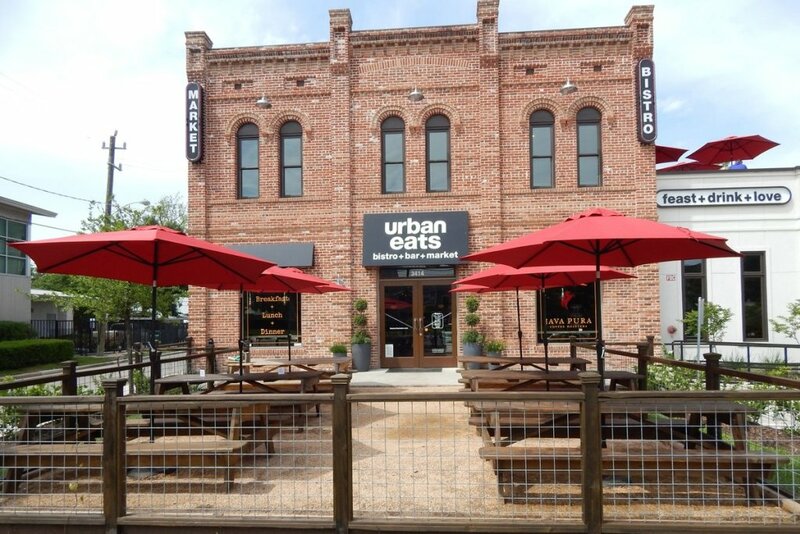 Urban Eats in the Heights offers an excellent lunch menu with comforting and healthy selections. Photo courtesy of Urban Eats. Urban Eats, 3414 Washington Avenue: For Houstonians in the Heights, it’s hard to beat Urban Eats for imaginative sandwiches and salads. Those looking for an office escape or blessed with an hour for lunch should take advantage of the well-portioned Lunch Plates menu, which includes a mix of indulgent and healthy options to suit the day. The Mac & Meat combo can even help shake off a bad office meeting. It includes a lunch portion of 3 Pig Truffled Mac & Cheese—smoky diced bacon, pancetta, honey glazed ham and white truffle oil—paired with sundried tomato and prosciutto meatloaf. Those watching their waistlines might opt for the Ahi & Couscous plate, which includes grilled sashimi-grade tuna filet seasoned with lemon and olive oil, then paired with warm basil-infused Israeli couscous and arugula salad. 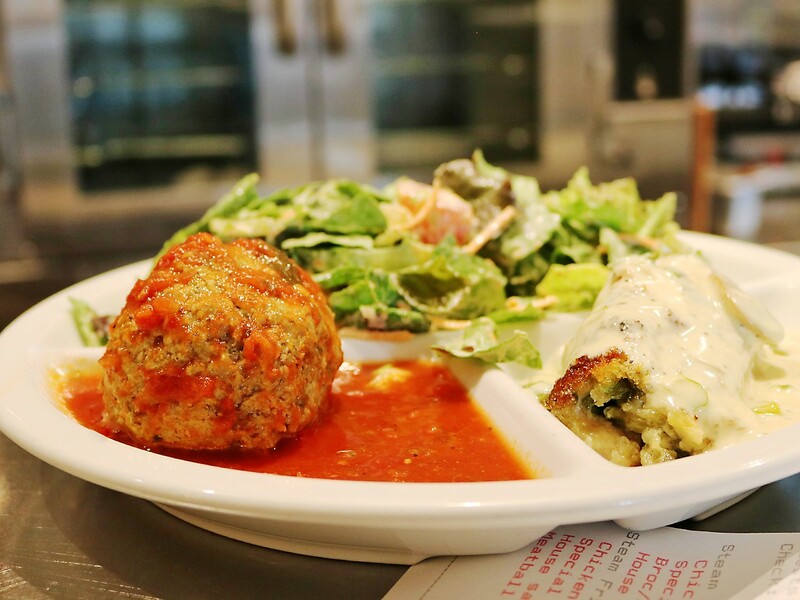 Lunch at Urban Eats lasts from 11 a.m. to 3 p.m. Mondays through Fridays.